are OUT OF PRINT, but we welcome your surname enquiry. There are four books in the series. 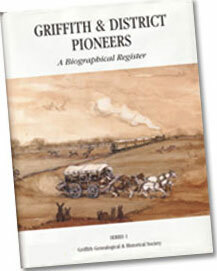 The biographies of the families represent a complete cross section of people occupying and working the land now known as Griffith and District. Every effort was made to contact as many of the earliest arrivals in the new irrigation area as well as the "Selector" families who were here before their land was resumed. However there are many pioneer families missing from this collection as many families did not respond to invitations to include their stories.